Latoya Parker had been searching for a job for quite some time with the journey resulting in dead ends. Finally, her professional luck took a turn for the better when she was extended an offer of employment in August. The experience taught Parker a powerful lesson about herself. An inner perseverance was pushing her forward. She wasn’t willing to give up. “I realized that if I want something, I won’t give up until I get it,” Parker declares. She was assisted in her job search efforts by the Individual Placement and Support (IPS) team in Nash County after being referred while seeking Monarch’s behavioral health services to treat her depression. IPS is an evidence-based practice to help people we support with mental health struggles who want to work. Paired with Employment Support Specialist Don Winslow, a member of the Rocky Mount and Wilson IPS teams, the two worked together to help Parker reach her goals. Parker, 34, is proud that she currently holds a 30-hour-a-week job as a press operator at Westwood Village Cleaners in Wilson. “I was excited when I heard I got the job. It is something to occupy my time and a source of income,” she says. Winslow, who personally knew the Wilson business owner, overheard his discussion of hiring needs while patronizing the business. Winslow told him he had the perfect candidate. Securing an interview for Parker, the two worked on her interview skills with mock question-and-answer sessions and how to emphasize her professional strengths. Parker said she appreciated Winslow’s knowledge and guidance. “It felt great to have someone else in my corner. I felt more confident with Don supporting me,” Parker says, adding that she also has the support of her family with whom she lives. The pair have agreed to stay in touch even though Parker is doing well and will be discharged from the program in the near future. “She is always giving it her best shot and her best effort every day. Her employer is very pleased with her work ethic,” Winslow says. 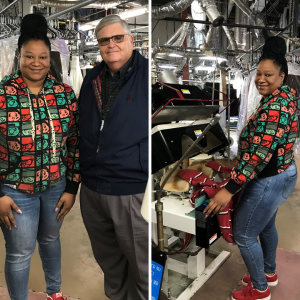 Photo caption: left, Latoya Parker and Employment Support Specialist Don Winslow; right, Parker during a typical day at her job at Westwood Village Cleaners in Wilson.